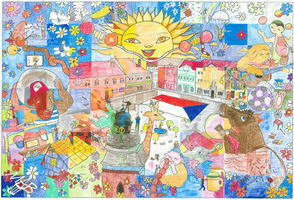 The overview of the projects of Marie Brozova’s public drawing events „The Defense of Colored Pencils“ in 2010. At every project you will find references to other photo-galleries, details of the drawings and more detailed information. Marie Brozova spent the days of pre-christmas time in her Colored Pencil Gallery working on the drawing „Christmas Quiet“. Visitors enjoyed the peaceful atmosphere far away from the Chrismas shopping rush. to all members of Colored Pencil Gallery team and to all my fans who give me the strength to continue in working in public and bring me inspiration for writing new books. Marie Brozova created „November Fairy“ in her Colored Pencil Gallery and visited with ger public drawing event Silver Christmas Days trade fair in Prague Exhibition Center Letnany. Ms. Sona Scheeova for the invitation to the trade fair. A new book „Souls of Stones“ is out! Marie Brozova has written and illustrated a new book! „Souls of Stones“ book launch event took place in Palace of Books Luxor in Prague Wenceslas Square November 20th, 2010. Famous Czech painter Reon Argondian became the patron of this illustrated book for adults. Marie Brozova also created a new drawing in the bookshop, titled „Kiss of the Rocks“. to Zuzana Turnova and Petr Sasek from Palace of Books Luxor for great help with organizing the project in the bookshop. to the painter Reon Argondian for accepting the role of the patron of my new book. Marie Brozova opened a new cycle of her public drawing events – fairies representing each month of the year. She started with the October Fairy, because Golden October is her favorite month. Her public drawing event attracted thousands of people thanks to the original exhibition of her drawings in Prague metro. to all the members of Colored Pencil Gallery team. Marie Brozova created a new drawing „Cloud Race“ in Prague trade fairs: FOR TOYS and FOR DECOR, both took place in Prague Exhibition Center Letnany. 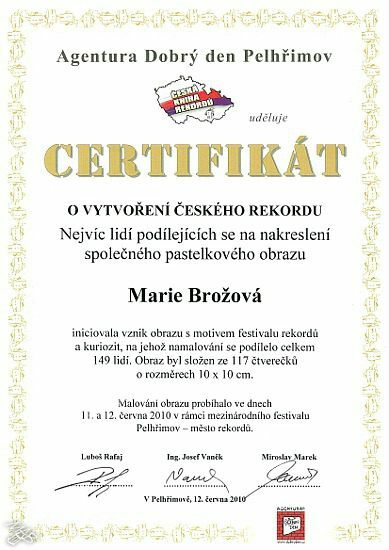 Marie Brozova was invited to FOR TOYS trade-fair by Good Day Agency, that registered her record size drawing in the Book of Czech records. to Ms. Sona Scheeova for the invitation to FOR DECOR trade-fair. to young reporters from Children Press Agency for an interview prepared in the professional way. Marie Brožova visited Metropole Zlicin with her public drawing event and created a new drawing titled “Little Mermaid’s Home”. Passages of the shopping center were decorated with a large exhibition of Marie Brozova art. Marie Brozova with the Prague Urban Forests Ecology Center opened colored pencil and educational workshops in Kunratice Forest for schools and wide public. This project was titled Bird‘s twitter Marie Brozova created a drawing „The Sun of Birds of Prey and the Moon of Owls“ inspired by native American culture. The public drawing event started by presentation in Chodov Shopping Center and continued in the nearby Kunratice forest. Cooperation with Prague Urban Forests began in 2008 by the workshop Souls of Trees in Prague Stromovka Park and continued in 2009 by the project On the trail in Kunratice Forest. The Czech Broadcasting – Prague, children’s internet alik.cz and Chodov shopping center became the media partners of this event. Thanks to Ms. Katerina Nova, Chodov shopping center marketing manager, for the help with organizing the project. Marie Brozova created one of the last remaining illustrations to her new book Souls of Stones – lapis lazuli, inspired by the ancient Egypt mystery and also by her childhood memories of the magical moment when the dusk fell over the playground. To all members of Colored Pencil Gallery team. Marie Brozova visited Jindrichuv Hradec with her Defense of Colored Pencils event for the sixth time. In front of renaissance Langer House she created the drawing titled Alchemy of Transmutation, planned as an illustration for her new book Souls of Stones. The public drawing event was followed by the exhibition of Marie Brozova art in Langer House. Thanks to Sabina and Jiri Langer for the invitation to Langer House. Thanks to Andrea Laskavec for warm welcome and inspiration. Marie Brozova visited ZOO Liberec with her public drawing event for the second time. This time she created a drawing titled „Giraffe Perspective“, planned as an illustration to her new book Souls of Stones. All visitors admired her exhibition including the red elephant on the drawing „The Ark Looking for Dry Land“, created by Marie Brozova at Liberec ZOO in 2008. Thanks to the director of the Zoo Liberec David Nejedlo for the invitation and accomodation at the ZOO. Thanks to Ms. Jitka Srpova for the initiative and great help with the organization of the whole project. The Defense of Colored Pencils visited historic town of Kutna Hora for the fourth time. Kutna Hora brings an endless source of inspiration to Marie Brozova. During the first week of summer vacations she created a drawing titled „Ruby Bogatyr“ as an illustration to her new book, Souls of Stones. Thanks to Ms. Eva Godlewska and Ms. Olga Trejbalova from Kutna Hora Guide service and Infocenter for the invitation and kind help with organizing the project. Marie Brozova created a drawing titled „Amethyst Unicorn“ in front of her Colored Pencil Gallery near Old Town Square in Prague, as an illustration to her planned book Souls of Stones. Her colored pencil skills were admired by tourists from all around the world. During the 20th Festival of records in Pelhrimov a unique piece of art was created – the collective drawing – a copy of the largest drawing created by Marie Brozova in 2007. About 150 visitors had the chance to take part in the process of creation. Congratulations! Marie Brozova visited Brno – south Moravian metropole - for the first time with her public drawing event and the exhibition of her drawings. In Knihy Dobrovsky Bookshop in Brno center she created a new drawing titled „Evening Star Princess“ planned as an illustration for her new book Souls of Stones. to all colored pencil project fans who came to see me a long way from their home. I really appreciate that. Marie Brozova presented her work and her publishing house at the 16th international book fair Bookworld organized in Prague Fairground. She was invited by Dobry den Agency, Czech version of Guinness Book of Records that registered her record size drawings created with colored pencils to the Czech Book of Records. Thousands of visitors admired her colored pencil skills on her new drawing Secret of the Snake, planned as an illustration to her new book Souls of Stones. She also enjoyed the opportunity to try how it feels to write with the record size pencil in the record size writing pad. Thanks to Josef Vanek from Dobry Den Agency for the invitiation to the Bookworld Fair. For the fourth time Marie Brozova presented her imaginative art at Esoterika - trade-fair of esothery, spiritual science, healthy life style, alternative medicine and ecology in Prague-Holesovice Fairground. This time she started to work on her drawing titled Secret of the Snake. Thanks to Ctirad Hemelik for the invitation to the Esoterika trade-fair. Thanks to Alzbeta Sorfova, the manager of the internet TV cestyksobe.cz for an interesting interview. Thanks to Jan Bazant for the photo-documentation of the whole event. Marie Brozova’s drawing Tiger and the Moon is referring to the Chinese year of Tiger and announces planned book Souls of Stones by Marie Brozova (it will appear as an illustration to the tiger’s eye stone story). Marie Brozova started to draw it in public at FOR HABITAT trade-fair in Exhibition Center Prague Letnany and finished it in her own Colored Pencil Gallery in Prague Center. Thanks to Ladka Hanzlova for the great support during Colored Pencil Gallery public drawing event. Marie Brozova opened the seventh year of her project of public drawing events The Defense of Colored Pencils in Prague Shopping Center Letnany. Creation of the drawing titled Springtime of the Feline Soul was followed by a large exhibition of more than 50 large size drawings by Marie Brozova that decorated the shopping center passages in March.